1 of 1 Cook beef in a large nonstick skillet over medium heat for 5 minutes, breaking apart with a wooden spoon. Drain off excess fat. Add chili and garlic powders and cook 1 minute. Stir in beans; heat through, about 2 minutes. 1 of 2 In a small bowl, whisk mayo, milk, lime juice and sugar. Set aside. 2 of 2 In a large bowl, toss lettuce, pepper strips and cherry tomatoes with dressing. 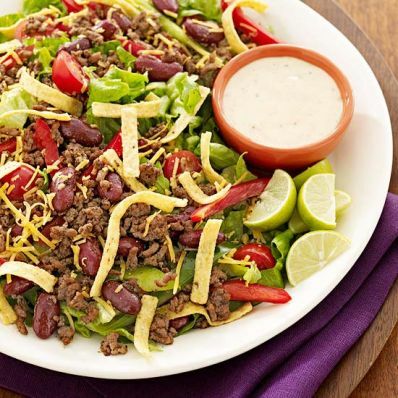 Top with beef mixture, shredded cheddar and tortilla strips.